Budget Everest base camp trek is designed for budget travelers who wanted to make their holiday in a tight budget. 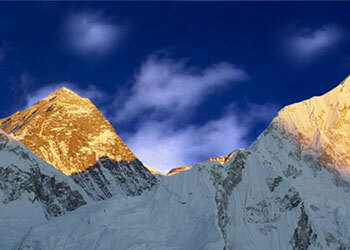 Everest region is one of the popular destinations among many travelers. When it comes to trekking most of the trekkers recommend and go for Everest region Trek. Everest Base Camp Budget Trek is a short trek to the Base Camp which is specially designed for those who wants to experience the no 1 destination of Nepal within a limited budget. Budget Everest Base Camp Trek is a journey passing through Namche Bazaar, Lukla, Mysterious Kala Patthar and the whole Solukhumbu vicinity, located in the lap of looming Mt. Everest. Those who took on the challenge of conquering this region can expect most majestic views of the mountain peaks, scenic beauty of Dudh Koshi and incredible natural scenery of the area. The vicinity of the world’s highest mountain range will make you feel like you’re on the top of the world. Walking through Everest region you will get once in a lifetime chance to experience lush flora of deciduous forests, scattered rice terrace fields, majestic pine forests, blooming rhododendrons and colorfulness of thousands of flowers. This area is also habited by most exotic fauna. As you will bypass through Sagarmatha National Park keep your eyes open for Himalayan Tahr, musk deer Pikka and mouse hare. The Trek starts with an exciting flight from Kathmandu, to Tensing Hillary airport at Lukla. During the trek, you will experience wonderful hospitality of Sherpa’s and their traditional lifestyle which will surely amaze you. It brings an unforgettable experience of the overwhelming vistas of the Everest Himalayan chain of Khumbu region, which consists of five of the world’s highest mountains: Mt. Everest (8,848m), Mt, Makalu (8,463m), Mt, Cho Oyo (8153m), Mt. Lhotse (8,501m) and Mt. Lhotse Shar (8,393m). Aside from the beauty of the Himalayas, this area includes natural wonders heritage site indexed by UNESCO. Rich in pine forests of rhododendron (Nepalese national flower) and an endangered species of birds and animals this trek is truly unique and memorable. For the trekker who is searching for the adventure in their life with the limited budget in hand, Everest Base Camp Budget Trek is the most recommended trekking. Day 01 - Fly from kathmandu to Lukla (2,840 m/9,318 ft.) & trek to Namche Bazaar (3,440 m/11,286 ft.). Trek hour: 6-8 hrs. Early morning we fly from Kathmandu to Lukla via mountain flight of about 40 minutes scenic flight. With clear weather, we get spectacular views of the mountains, including Everest as we enter the deep gorge of the Dudh Kosi valley. You begin your trek from Lukla, along the way you will have a view of Mt Nupla (5885m), Kusum Kanguru (6367m) and Kwongde Range. We then take an easy walk for about two hours to Phakding village from here The trail follows the Dudh Koshi valley north, meandering through the pines, crossing it twice by small suspension bridges before reaching the village of Monjo the entrance gate of the Sagarmatha National Park. Beginning with a slight climb to Jhorsalle, the trail passes waterfalls and other culturally and naturally occurring items of interest. You will be rewarded with your first glimpse of Kusum Kanguru (6369m) Thamserku (6608m), Everest (8848m) and Nuptse (7879 m). A steep climb up to the beautiful village of Namche Bazaar (3440m) will afford you further spectacular views and a comfortable place to spend the second night of the trek. Today we have Rest day at Namche Bazaar.Set in a natural amphitheater looking across to the jagged ridge of Kongdi Ri(6187m), Namche Bazaar is one of the most attractive settlements in the Khumbu region. We will have a full day rest so that we won’t face any problem ahead. Today we make a short acclimatization trek up to Khumjung, a delightful Sherpa village above Namche. You have full day leisure for wonderful panoramic view or stroll around the market You can also enjoy the splendid views of Everest, Ama Dablam, Thamserku, Nuptse, Lhotse, Tawche, and Kwangde and so on. The trail follows a downward path to Pheriche village. It joins the trail below Thungla beautiful views of Cholatse across the valley. After another steep ascends the trail climbs up and over the terminal moraine of Khumbu glacier. Today’s walk offers views of the Mt.Tawache, Ama Dablam and to the north-Pokalde (5741m), Kongma-Tse (5820m) and the great wall of Nuptse. The path follows a pleasant, grassy valley. Stark and rugged beauty create almost moonscape campsite at Lobuche a windswept collection of huts tucked in a narrow meadow between the glacier and the Lobuche peak. Tawoche and Nuptse are particularly spectacularly from Lobuche towering. Day 10 - Flight from Lukla to Kathmandu end of our journey. Saying a final goodbye to our porters, we will have a flight back to Kathmandu. Finish your trek. Meals, Accommodation during the trek, Alcoholic, hot and cold drinks, hot water, hot and cold showers.